L. M. Robin: Surf-riding in California, 1907. L. M. Robin: The Joys of Surf-riding. Given the brief nature of the correspondence, it is highly probable that the accompanying photograph was taken and forwarded by L. M. Robin as evidence for his claim; dated here as circa 1907, a few years ago before publication in 1909. The location appears to be California and the elevated side-on perspective is unusual, possibly shot from a breakwater or a pier similar to that in the background. John Mazza has suggested the location is the little point north of Santa Monica, known by the locals as Sunset, but usually recorded in print as Sunset Boulevard, see correspndence below. This break appears to be highly suitable for the solid wood fin-less boards of the era, Stern and Cleary (1963) describing it as a good learning spot because waves are usually gentle. Via Garry Lynch, Joel T. Smith suggested it could have been taken from Santa Monica Pier with Venice Pier in the background, or from Manhattan Beach Pier with Hermosa Pier in distance. And, Gary Weiss:noted the hills in the background of the pier much like a Palos Verdes Peninsula, probably ruling out the Venice Ocean Park and Santa Monica piers. He also commented that the elevation seems to indicate it taken from some place other than a beach or on the berm. and none of the Santa Monica Bay peers are that close to each other to indicate that the picture was taken from another pier. John Mazza suggested the location as the little point where Sunset Boulevard meets Pacific Coast Highway, near the entrance to Malibu. Usually recorded as Sunset Boulevard in print, the locals just call it Sunset. The pier in the background appears to be the Port Los Angeles Long Wharf which opened in 1894, then the longest wharf in the world. A quarter of the pier was removed by 1920 and it was fully dismantled by 1933. North of the current Santa Monica Pier, is original location is marked by an Historical Landmark monument plaque, along with a few feet of track, at the Will Rogers State Beach lifeguard headquarters. 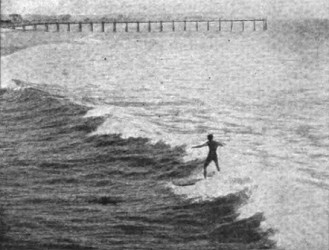 While some correspondents considered that the board-rider may be Hawaiian George Freeth, known to have first surfed at Venice Beach in October 1907, no-one canvassed the possiblity that it could be the (obscured) owner of the surfboard photographed at North Beach Pier, Santa Monica, circa 1905. Surfboard Rider, North Beach Pier, Santa Monica, circa 1905. Many thanks to all for their assistance. It is commemorated in Billy Wilder's film Sunset Boulevard (1950) and was the scene of Jan and Dean's 1960s hit song Dead Man's Curve. Long lines move in past point and develop into slow mushy waves on most all winter and summer swells (2-4 feet). But some larger winter swells (4-8 feet) produce good hard-breaking waves; long peak holds up and allows a fast shoot, with turning following. Small sections easily makable. Inside break poor. Usually best on lower tides, but medium tides favor larger swells. Improved by offshore winds. Blown out by south and west winds. No strong currents. Many medium-sized sharp rocks line the shore inside; at point larger submerged rocks and concrete block with projecting metal reinforcing-rods preent greatest hazard. Good learning spot because waves are usually gentle. Location: 4 miles north of Santa Monica Canyon, just below Sunset Boulevard. Area is part of Will Rogers Beach State Park. Surfing allowed day. Los Angeles City Lifeguard on duty 10 AM to 6 PM daily in summer. Parking on highway overlooking surf. Expensive yet inferior hamburgers at restaurant 100 yards past point. IN a recent number of The Strand I noticed a photograph of a man riding on a surf-board at Honolulu. While travelling in Southern California a few years ago I saw, at one of the beaches there, this same feat performed. As your contributor says, the man either stretches at full length or stands erect upon the board. The rider sometimes makes ten or twelve attempts before he is successful in balancing himself and the board on the crest of a wave, but when he does get it just the wave will carry him at a tremendous speed and it lands him far up on the beach. 738, Westminster Street, Providence, R.I., U.S.A.
(ca. 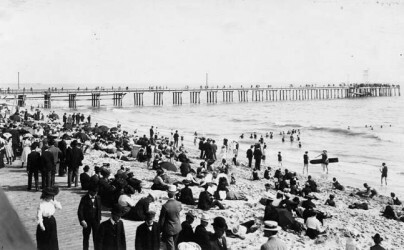 1898)* - View showing people walking on the boardwalk, sitting on the beach, and enjoying the surf with the North Beach Pier seen in the background. This was considered casual attire in the 1890s. In 2008, Cal Porter forwarded the image to Cary Weiss who, with the assistance of Ben Marcus, Gary Lynch, Arthur C. Verge and Joe Tabler, estimated the date as 1904-1905. 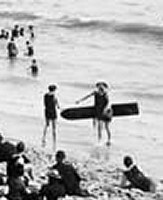 This is photographic evidence that there were surfboards in Southern California before George Freeth's arrival, from Hawaii, in 1907. The pier in question is called the North Beach Pier, built in 1898 north of where the L.A. Pier was located and partially destroyed. along with was wooden slatted board-walk, by a storm in 1905. Posted by Malcolm Gault-Williams at Monday, December 08, 2008. Geoff Cater (2017) : L. M. Robin: Surf-riding in California, 1907.